(Tech Xplore)—Designing robots' capabilities for running and walking intrigues and challenges researchers. A recent video of work done in Florida shows an interesting looking biped that uses, as The Verge put it, mechanics, not computer brains, to move. With this runner, you don't find sensors or computers on board. Paul Miller in The Verge said the design results in the robot being dynamically stable, "without a power-hungry CPU in the loop crunching numbers and making decisions based on sensor data." The team behind this robot is at The Institute for Human and Machine Cognition in Florida. The robot goes by the name of Planar Elliptical Runner. Only one motor drives the legs. An RC car radio controller determines how much power to apply to the motor. "The better the designs are mechanically, the less power and smarts are required to keep the robot upright," remarked Miller. This, said the video presenter, is the world's first "segmented leg biped running robot that balances by itself, not by feedback, but by its dynamic geometry." The robot was put through simulations recently. IHMC said in their video notes that they found initial simulations showed promising results. Paul Miller in The Verge: "A single motor in the middle of the robot drives the legs in an elliptical motion." The robot is dog-sized, he said. Will Knight in MIT Technology Review described it as looking like a tiny mechanical ostrich. Aaron Greenbaum in Geek Reply wrote about their clever design. "Torsion springs play a big part in keeping the Planar Elliptical Runner balanced, as these springs are designed to create 'reactive resilience.' What this means is if a leg meets resistance, the spring reacts by making the drive cranks feed more power into the leg until it overcomes the resistance. Similarly, extra power is fed into the other leg, so it can maintain a trajectory that prevents the robot from tripping over itself." So how fast can their PER go? Reports said it can run at 10 miles per hour. "The robot runs at 10 miles per hour, but if it were the size of a human it would travel at 20 to 30 miles an hour, the researchers said in Will Knight's report. "Give the robot more power and it runs faster. Less power and it runs slower," said the video notes. What's next? The robot was shown running with walls on each side to keep it going straight. Miller said, "the researchers think they know how to build a version that's stable from side to side without the walls for guidance." 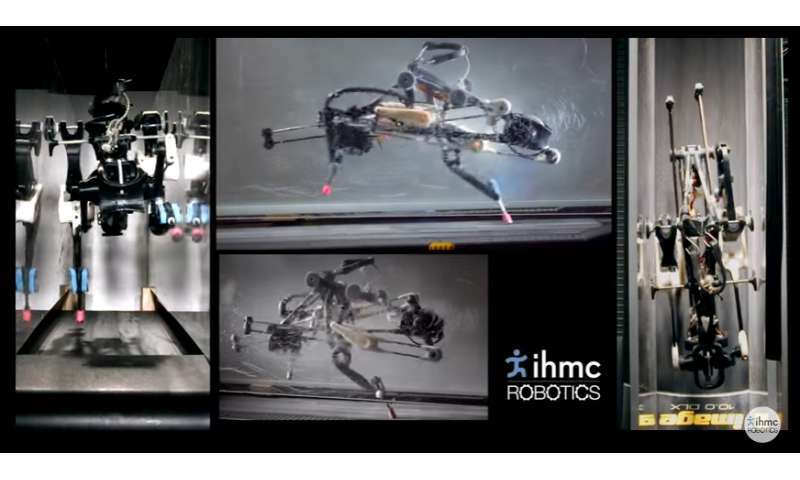 Jerry Pratt, a senior research scientist at IHMC, was quoted in MIT Technology Review: "We believe that the lessons learned from this robot can be applied to more practical running robots to make them more efficient and natural looking."